A glass-enclosed stairway connects the children’s space on the ground level, the entertainment area on the middle level, and adult bedrooms on the top floor. 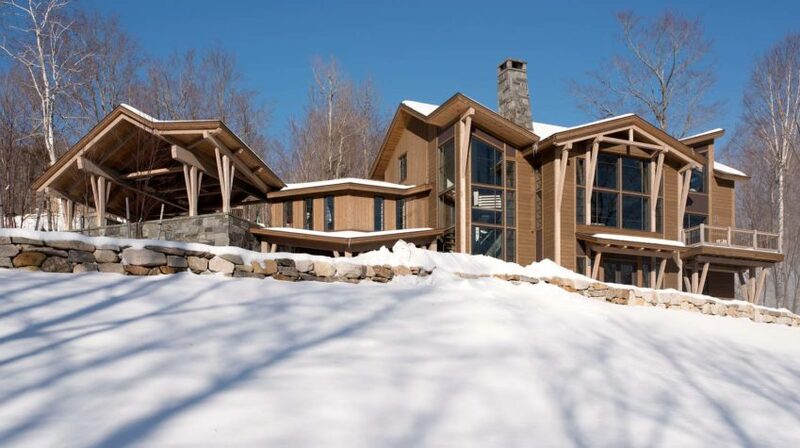 Architect Randall Walter looked to the overhangs of older Adirondack lodges, then lifted them by a half-gable here to allow more light on the inside and better views to the outside. Owner Meredith Tedford handled interior design for each of the five bedrooms and all of the five and a half bathrooms. 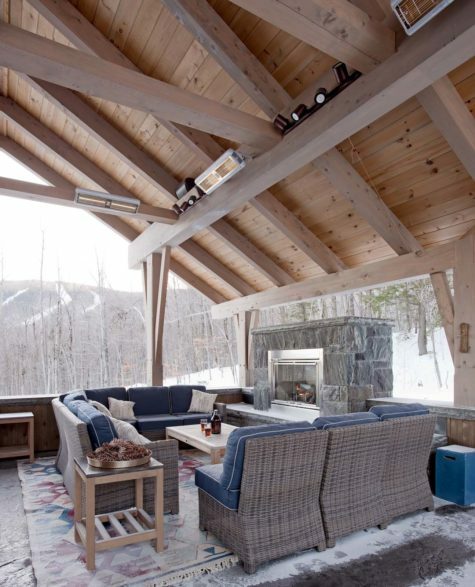 A covered outdoor ski deck above the garage is outfitted with propane heaters, a fireplace, and seating for lunches and beers. 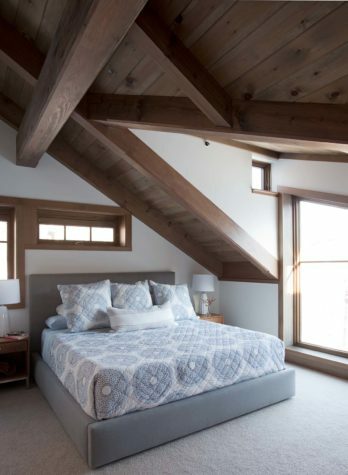 Owner Meredith Tedford handled interior design for all of the five and a half bathrooms. 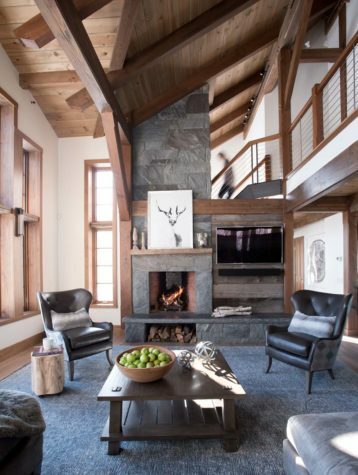 Architect Randall Walter aimed for a rugged mountain look. The design of a new timber frame home at the Sunday River Resort was driven by the simple concept of family fun. With five bedrooms and five and a half baths, the house is designed to accommodate as many as 18 people on weekends. It encourages them to play together, whether on the slopes, over a jigsaw puzzle, around a board game, or outside on the covered ski deck. A giant island in the kitchen merges into an open-concept living area and draws people into the center of the home. Meals are celebrated around a table that seats as many as 14. 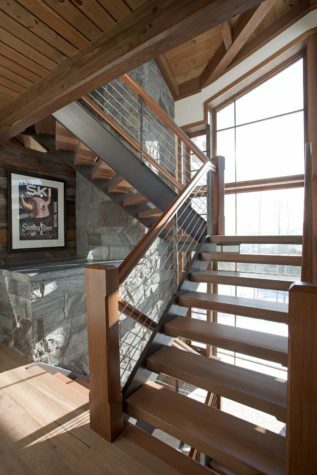 The ski deck on the middle level also organizes the rest of the home. It opens into the main entertainment/dining/kitchen area, which in turn opens to a connector to the ski area. 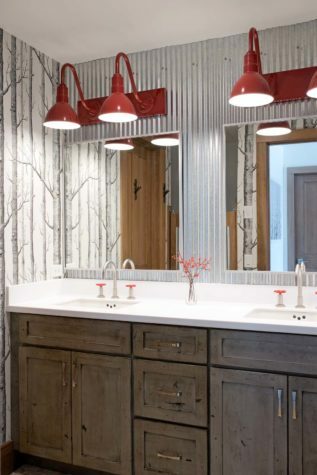 “There’s a snow room transition space with a half-bath—and from there you go out on the trail,” Walter says. He found the stone artisan he needed in Jordan Keller of Keystone Masonry in Hebron. Brought into the high-end masonry firm in the early 2000s, Keller earned his chops before buying the business in 2010. Today, he’s grown his crew to five stone-masons. Bensonwood, however, works first on a factory floor. 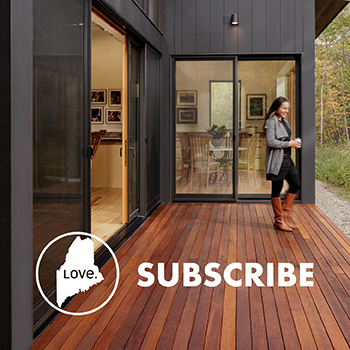 The firm employs a range of services in Walpole—architecture, interior design, carpentry, millwork, walls, floors, and roof structures—with prepaneling. Where a site-built project might take 15 to 24 months, Bensonwood can complete it in 9 to 12 months. It’s a high-performance, sustainable home too, thanks to walls packed with 10 inches of cellular insulation. “There’s air tightness,” Walter says. “It’s nearly at passive house levels, for much lower energy costs and comfort, beauty, and durability also.” That means much lower maintenance than traditional construction—and much more time for family fun.